August 5, 2012 -- Steve Torrence not only officially secured a starting place for NHRA’s Countdown to the Championship, but he did it in winning fashion Sunday by outlasting a tough Top Fuel line-up on a 90-plus-degree day to claim the the O’Reilly Auto Parts Northwest Nationals title at Pacific Raceways. The victory was the Kilgore, Texas driver’s third in his fifth final round of a season that has carried him from a challenger to a true championship contender. It also fulfilled a promise Torrence made one week ago after a first-round loss at Sonoma, Calif.
“We are going to Seattle and we are going to close this Western Swing with a bang,” he commented at the time. This triumph was well-earned. He ended the competitive day for Steve Chrisman, Khalid alBalooshi, Doug Kalitta and Shawn Langdon allowing him to climb within one point of third-place Tony Schumacher (1,109-1,108) in Full Throttle Series standings. His first-round decision over Steve Chrisman – featuring a sashaying Torrence Racing/Capco Contractors Inc. dragster going down the 1,000-foot track – was the most spectacular of the day highlighting his sharp driving skills. He stopped the timer in 4.563 seconds at 208.46 mph to beat Chrisman’s traction-troubled run of 6.880 at 84.31. “I didn’t think the car moved around that much until I saw the replay,” he recalled. “It was my job to get the car to the finish line . . . and I did. Steve Chrisman has a very consistent race car that goes down the track. I heard him there beside me and I knew I had to stay there. As long as I heard him there I was going to pedal the car. Torrence left first against alBalooshi in the quarterfinals -- .067 to .099 – and advanced with his fifth hole-shot decision of the season, 3.879 at 303.03 to a 3.877 at 312.64 before ousting Doug Kalitta in the semifinals with a 4.138, 274.898 to a 6.310 at 142.39. In the finale against longtime friend Shawn Langdon, Torrence was determined to finish first . . . and then he was one of the last ones to find out that he had. The winning time was 4.168 seconds at 261.98 to 4.329 at 254.57. 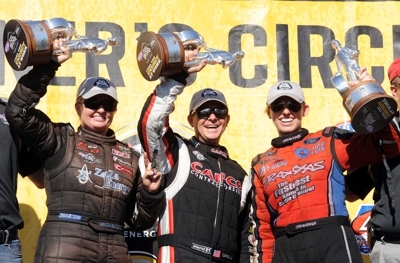 The team resumes series action at Brainerd, Minn., Aug. 17-19, in the Lucas Oil NHRA Nationals.